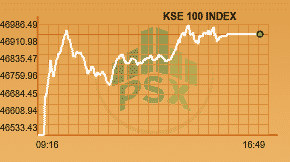 The KSE-100 Index opened positive in the morning, gaining 455 points in intra-day trading and closed in green at 46949.04 points with heavy volumes. Steel sector brought up the gain today and helped the market to sustain the bullish momentum. Investors have welcomed the political stability. Volumes surged as the index jumped closer to 47000 levels as it continued its gains yesterday as well. Participation during the month remained weak with volumes coming down by 31% MoM to average 175 million shares in Jul’17. Uncertainty on the currency (concerns on the external front) and rising political risk premium kept foreigners at bay resulting in net outflow of US $ 37.9m during the month. On the local side, Insurance companies (net inflow of US$ 39.26m) along with Banking institutions (net inflow of US$ 20.97m) were active on the buying side whereas mutual funds remained sellers offloading US$ 30.57m worth of equities (first monthly outflow this calendar year). Overall, trading volumes are getting better and All share index surged to 367 million shares compared with Monday’s tally of 256 million shares. Shares of 389 companies were traded. At the end of the day, 263 stocks closed higher and 107 declined while 19 remained unchanged. In KSE 100, 154 million shares were traded with a net worth of Rs 11.93 billion. ENGINEERING was the top traded sector with total traded volume of 46,993,000 shares. It was followed by CHEMICAL with a total traded volume of 41,850,180 shares and CEMENT sector with a total traded volume of 35,668,900. K-Electric LTD was the volume leader with 29.45 million shares, gaining Rs 0.24 to close at Rs 6.93. It was followed by Bank of Punjab with 24.03 million shares, gaining Rs 0.09 to close at Rs 11.36, TRG PAK LTD with 23.31 million shares, gaining Rs 2.13 to close at Rs 45.85 and Aisha Steel Mill with 22.68 million shares, gaining Rs 1.07 to close at Rs 22.56.